about 5 years ago, i began riding motorcycles. it was a small piece of a rather pedestrian rebellion that would begin to reform how i viewed my life and how i wanted to live it moving forward, but i still consider it a very important part of who i have become and what i have accomplished in the years since. 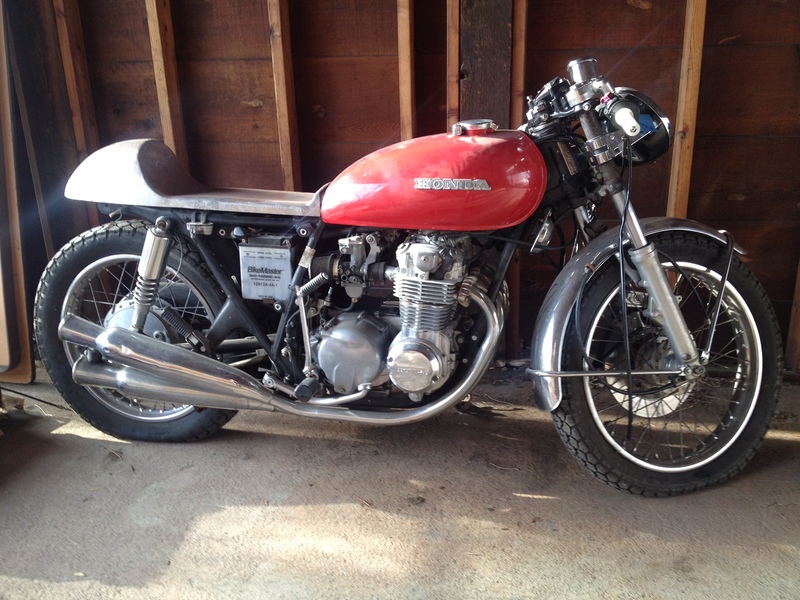 i bought a 40 year old honda bike with the intention of restoring it and converting it into a “cafe racer,” a throwback homage to the classic bikes of the 40s, 50s, and 60s. the steve mcqueen era. unfortunately it didn’t take long for me to realize that i was in way over my head. my first crack at working on carbs and rewiring the electrical system in the bike was pretty miserable, and finally after one day going on a short ride to a nearby watering hole with some friends and getting stranded outside the front when the bike wouldn’t start back up again, i decided being part of the “built, not bought” crowd wasn’t something i had the patience or affection for. i went to my local bike dealer, erico motorsports, and reserved a brand new moto-guzzi v7 racer. she looked 50 years old and was every bit of apparent “vintage” that i wanted, minus the maintenance or authenticity. but hell, i didn’t care. i just wanted to ride. eventually, after many mountain rides through the rockies and my first scary car accident (which i somehow walked away from, fortunately), i stumbled into a fun new event on facebook called the Distinguished Gentleman’s Ride. it was an event that had started in australia where guys with bikes like mine (or cooler) would get dressed up in old-school dapper fashion and then go on a ride around town. it looked incredible and i had to be involved. i found that some guy had volunteered to host, but then mysteriously ghosted everyone weeks before the ride, leaving the facebook group in disarray. i emailed the foundation organizer in australia asking if there were any details and how to get involved, and he suddenly made me the ride organizer. i was not ready for this. my rides usually consisted of me picking a road and seeing where it went. the pressure of planning a ride for a city like denver, even if it’s only 15 people, was more than i wanted. i just wanted to dress up, show my bike off, and make some new friends. nevertheless, i started emailing anyone i could find that had shown interest on the facebook page, and luckily, i found a couple guys who had done an unofficial distinguished gentleman’s ride the year before. guys who actually knew what they were doing. they agreed to help me plan the ride and route. After another successful Distinguished Gentleman's Ride today in Denver, the planning team is shutting it down for the night. Thanks to all the amazing bikes, suits, mustaches, beards, gentlemen and lady riders, and donors who helped out or contributed in any way, and thanks to every one of the over-200 riders who participated. We raised over $23,000 for Prostate Cancer research today and we looked damn good doin it! Keep an eye out for the coming weeks, and we'll have a little viewing party for the short film I'll put together in the coming weeks!